We had an amazing time In this place and a wonderful time driving around the area. The evening local music included a real community feel... not simply entertainers, but community involvement that I particularly relished. We took our washing over to the little laundry on Valentia and it was delivered back to the B & B! 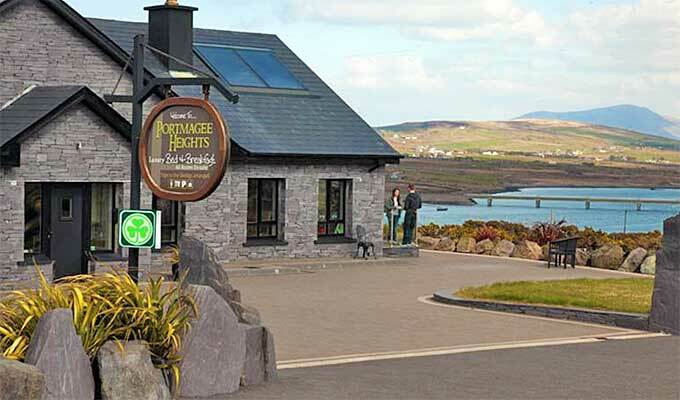 it's worth mentioning that you are staying at Portmagee Heights to see if it is offered to you! This was by far the best stop on our trip! We cannot say enough about Monica's graciousness. She made us feel right at home and was able to get us to Skellig Michael which was the most wonderful experience of our trip. We will remember our stay fondly. Room was very nicely decorated and staff were friendly, providing advice and tips on where we can visit. However, it would be better if the dining hall is kept open for guest use throughout the day instead of breakfast timing only. Great location and views just up the road from town and the harbor. The home is modern and our room was spacious and the beds very comfortable. Monica, the owner, was extremely pleasant and helpful throughout our stay. We highly recommend this property. The B&B was lovely. The room is large, comfy, clean. The place is run very efficiently. Resembles a hotel more than a B&B soaps, towels, etc alll very hotel like. Monica got us on the boat to Skellin against all odds. Highly recommended. By far the best B&B we stayed in on a 10 day trip throughout the West and South of Ireland. We had a good sized bedroom and en-suite bathroom with the kind of quality in terms of fittings and finish we expected but unfortunately didn't find in other B&Bs. The breakfast was delicious and beautifully presented. Monica and her husband work hard and have given great attention to detail. Ce B&B a Ã©tÃ© particuliÃ¨rement agrÃ©able. La situation est calme et avec une vue magnifique sur l'ile de Valentia. La dÃ©coration de la chambre et de la salle de petit-dÃ©jeuner Ã©tait magnifique, le dÃ©jeuner dÃ©licieux surtout les pancakes avec les fruits, la douche avec jets massants parfaite! Nous avons recommandÃ© ce B&B a d'autres touristes franÃ§ais croisÃ©s en chemin et nous le recommandons Ã tous. Le service et la gentillesse de l'hÃ´te vaut largement le prix de la nuit. Portmagee est un petit village de pÃªcheur qui n'a pas encore Ã©tait envahi par les touristes, nous vous recommandons le pub "The Bridge Bar" ! !